Dr. Oz at the BolderBOULDER 2010 - Klein Photo, Ltd.
Dr. Mehmet Oz at the BolderBOULDER 2010. Dr. Oz ran the race then showed up at Folsom Field to hold the tape and encourage the International Racers at the finish line. The 3rd Place elite woman, Emily Chebet of Kenya, collapsed immediately after crossing the finish line. Dr. Oz immediately jumped to her aid and, at a race official's insistence, carried the runner away from the finish chute so that she could receive water and medical attention from the Pridemark paramedics. Subsequent sequences show Dr. Oz surprised and pleased when the Ethiopian men's team crossed the finished line arm-in-arm in a show of solidarity, then getting a high-5 from the 4th place men's finisher, Colorado's own Brent Vaughn. Dr. Oz manned the line throughout the entire International Race finish, cheering for each of the runners as they passed by. ------- All images presented as shot. These are unretouched, full-frame images directly from our cameras without modification. 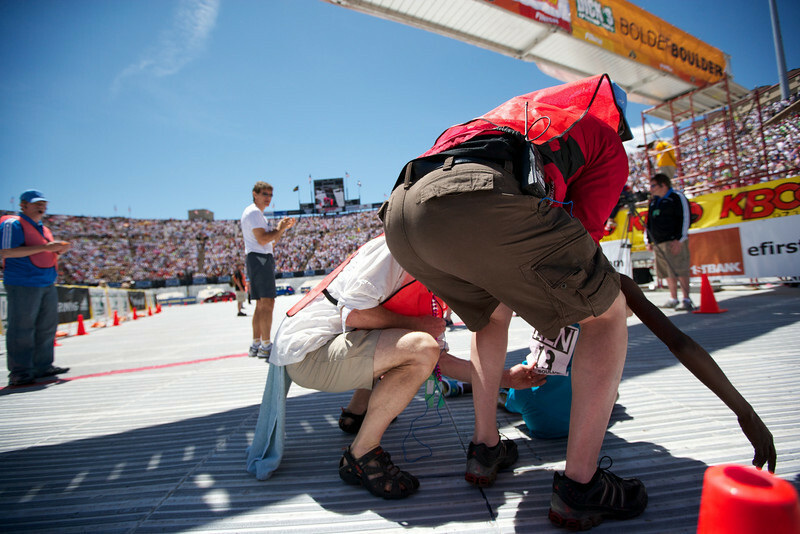 ------- Images and media may be only used by the BoulderBOULDER, the University of Colorado, Dr. Mehmet Oz, Team USA & Team Colo. All others must obtain written permission.